Having heard good things about One Hand Washes the Other (OHWTO) and it's famous acne fighting soap- as well as always on the lookout for another way to reduce my skin issues, I made an order not too long ago for a sample bar. 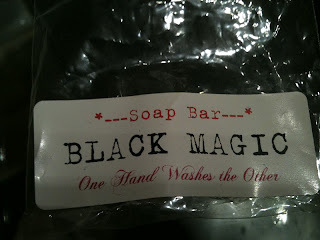 Black Magic soap is a hand made soap containing a bunch of clarifying and cleansing ingredients, and many of the reviews I had read in the past have been highly positive. 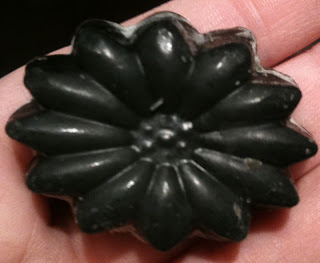 The soap itself is black in colour with a slight green tinge. It's not dyed or coloured to look this way on purpose, instead it contains naturally dark activated charcoal (an ingredient that pulls impurities towards itself) giving it it's black appearance. 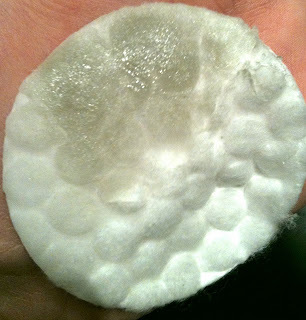 You don't have to worry though, it didn't stain my facecloths, completely rinsing clean. I rubbed the bar wet on a cotton round below so you can see that the soap isn't that dark when you're using it. Black Magic does have a distinct and strong smell. 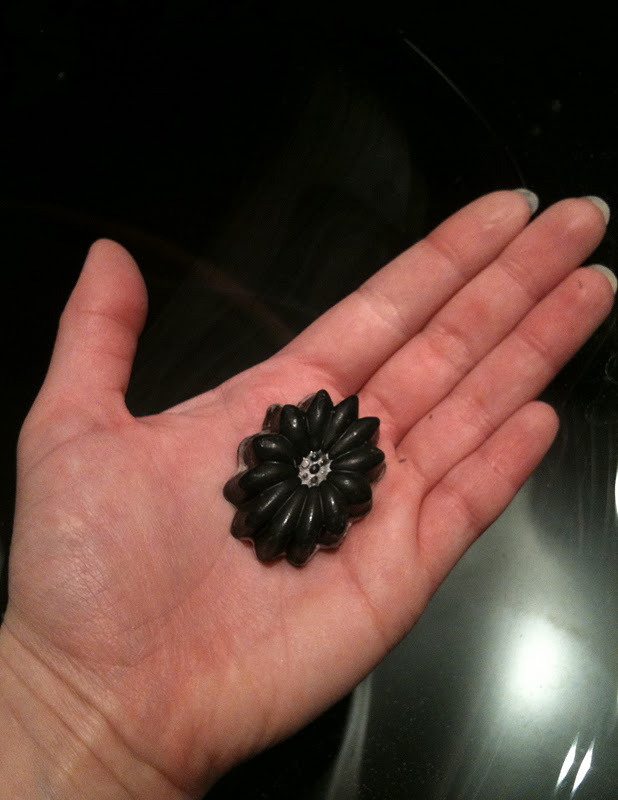 It's very herbal with a peppermint undertone that dominates where ever you store the soap. It wasn't unpleasant just kind of overwhelming the first time I whiffed it. It didn't fade all that quickly either. Unfortunately, this is where the good aspects end. My skin didn't like this soap at all. It worked well for cleaning but it left my skin feeling tight. 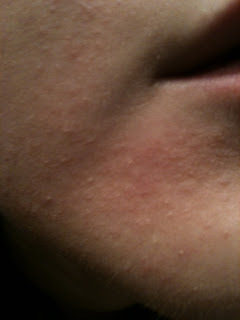 Then my skin broke out into an uncomfortable rash. It was sore and dry and bumpy for about a week. So I only used it twice (once at night and once the next morning). It seemed to be okay on my forehead and upper cheeks but my lower cheeks and chin were scaly red ickyness. You can see my skin's reaction in the photos below. So, needless to say this doesn't work for me. I'm thrilled it works so well for others out there, but I personally just can't recommend it to anyone based on my reaction. I am glad that OHWTO offered the bars in sample sizes at very reasonable prices so that you didn't have to buy a full size unsure how your skin is going to react. The idea behind the soap is great but it just didn't work for me. I do have a couple other items I purchased from OHWTO that I'm very pleased with so be on the lookout for a more happy-ending of a review soon. 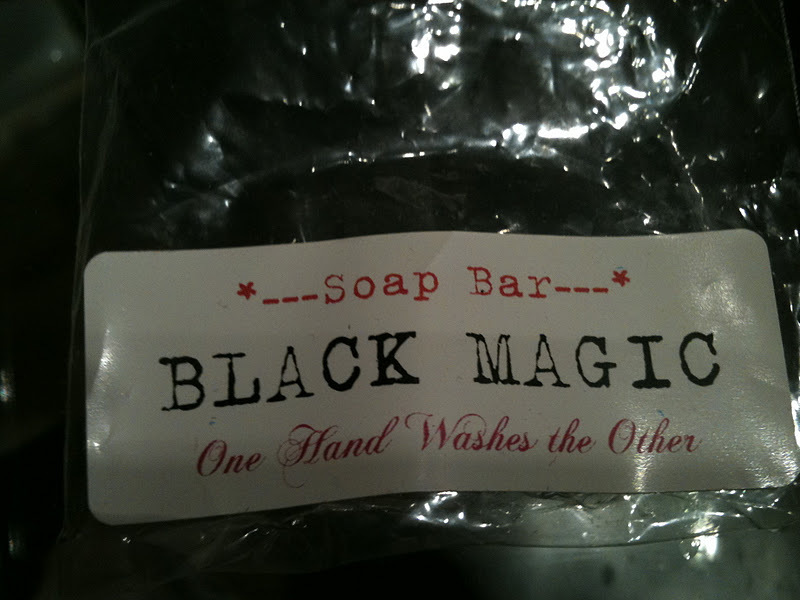 Overall, Black Magic soap just wasn't a good fit for my skin. 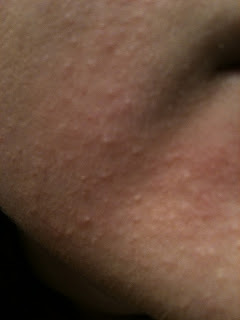 It was too strong smelling, too drying and caused a rash. Would I buy it again? No, I had to throw the sample out after two uses, unfortunately.